Today’s selections highlights banjo picker J.H. Bragg, who was quite a prolific player in the Texas jazz scene of the 1920s and ’30s, but like many of his contemporaries, has fallen into near total obscurity in the present day. John Henry Bragg was born in Fort Worth, Texas on August 10, 1898 into a family of musicians. His father was a medicine show entertainer in the latter part of the nineteenth century, and later taught all of his family to play instruments. John Bragg learned to play guitar and piano, but later switched to banjo because it could be better heard over a band. Bragg’s first professional engagement was with the Sadie Smith Jazz Band in Fort Worth around 1918. He was married to blues singer Ardell “Shelly” Bragg, who recorded several sides for Paramount Records in 1926 and ’27. In 1927, he went to San Antonio to play in Troy Floyd’s orchestra at the Plaza Hotel (and the Shadowland speakeasy), with whom he remained until the band broke up in the early ’30s. In his later years, he claimed to have been responsible for introducing Don Albert to Floyd. In late 1928, Bragg, along with some other members of Floyd’s orchestra, accompanied blues singers Hattie Burleson, Ben Norsingle, Jewell Nelson, and Ollie Ross in a series of sessions held by Brunswick and Columbia in Dallas. Like his former band mate Don Albert, Bragg formed his own band in the 1930s, his Rhythm Five, though it never found the same notoriety as Albert’s famous swing band. The Rhythm Five recorded but one session for Vocalion in 1935, which yielded four sides, all of which were issued. During World War II, Bragg was hired to play at Fort Sam Houston in San Antonio, and he retired in 1968. In 1980, he was interviewed by Sterlin Holmesly. John Henry Bragg died on January 1, 1988, and was presumably buried next to his wife Ardell in San Antonio’s Eastview Cemetery, though no date was ever chiseled into his tombstone. Vocalion 03174 was recorded on August 28, 1935 in San Antonio, Texas, the only session by Bragg’s Rhythm Five. In the band are Joe Hathaway on alto sax, Al Freeman on piano, John Henry Bragg on banjo, and Walter Warden on string bass. Israel Wicks sings the vocals. First, one of more commonly reissued of the four sides waxed by Bragg’s Rhythm Five, “Frisky Honey” was featured on the CD compilation That Devilin’ Tune – A Jazz History (1895-1950). Frisky Honey, recorded August 28, 1935 by J. H. Bragg and his Rhythm Five. In their last side cut at the session, they play an energetic rendition of Cow Cow Davenport’s “Mama Don’t Allow” as “Mama Don’t Like Music”, with their “mama don’t allow no [what have you] played in here” verses allowing for ample solos from each musician. I can’t find that this side has ever been commercially reissued, though I can’t understand why, it’s a fine tune. 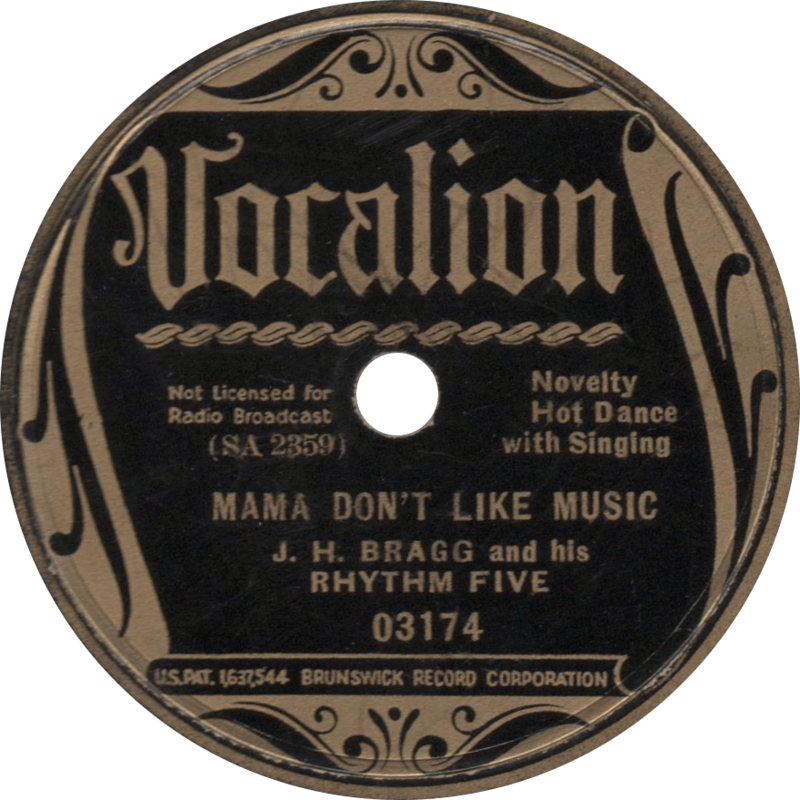 Mama Don’t Like Music, recorded August 28, 1935 by J. H. Bragg and his Rhythm Five. This entry was posted in Records and tagged 1930s, 1935, Al Freeman, Blues, Israel Wicks, J.H. Bragg, Jazz, Joe Hathaway, San Antonio, Territory Band, Texas, Vocalion, Walter Warden by R. Connor Montgomery. Bookmark the permalink.